Hi. It's time to share my favorite potty with you. The top hat potty, or baby potty bowl, is s really the only thing I recommend as "essential" for ECing from birth or in the first year. It is discreet, comfortable, and lightweight. Great for nighttime. On the go. Nursing. Travel. Car pottying. I was so bummed about this that I'm making sure that never happens again by producing my own top hat potty...but it is even better than the old classics. Preorders open *today* for The Baby Potty - a recyclable top hat potty which comes with a potty cozy and rubber grip. My goal is to raise another $5,000 to make this second round of manufacturing, including molding costs, happen. Please support in any way you can...even if you don't need a potty you can order a sticker or share the campaign with others! This preorder is only open for 7 days (thru Feb 18), so if you think you might want one for you or a friend, please do not hesitate to place your order right away. EC While Out + About: Eager (or afraid) to try EC on outings or travel? This'll get you going. I demonstrate catching an actual post-feeding pee with Branson, 12 weeks. Again, the preorder is only open for 7 days. 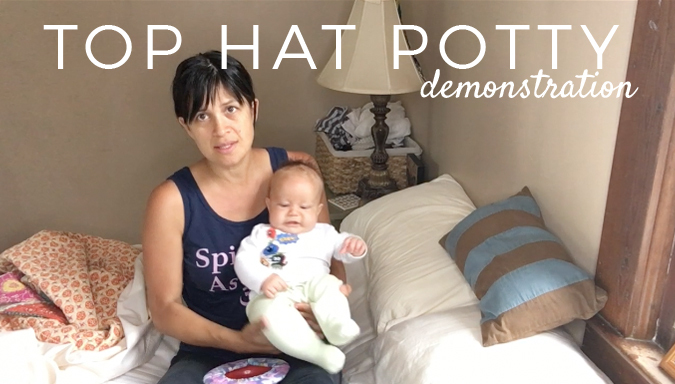 Night Time EC: Learn how (and whether) to potty your baby at night. If you simply have to have one, you can go ahead and preorder here.